I am often asked my favorite wines for pairing with food. Certainly among my favorites are the 2005 Silverado Vineyards Vineburg Chardonnay and the 2003 Silverado Vineyards Napa Valley Cabernet Sauvignon. 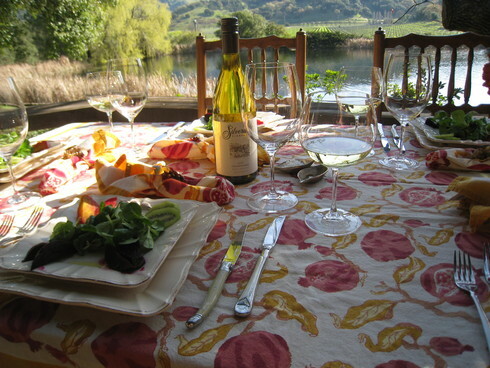 The 2005 Silverado Vineyards Vineburg Chardonnay features 100% chardonnay grapes from a single vineyard. The wine has flavors of apples, citrus and oak that create a perfect balance on the palette. It pairs beautifully with my Roasted Chicken with Roasted Meyer Lemons. The wine sells for $30 per bottle. The 2003 Silverado Vineyards Napa Valley Cabernet has aromas of blackberries, plums, cherries and chocolate. It is intense, rich and well-balanced. It is a spectacular pairing with my Filet of Beef Tenderloin Roast. It sells for $43 per bottle.